The question is: what can then an investor do to improve the chances in benefiting from up markets and limiting the damage from down markets? 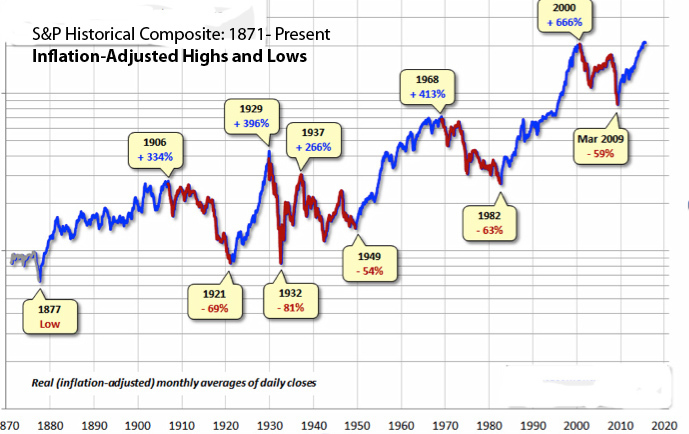 Are there any techniques available that improve investment results under inherently cyclical conditions that are unpredictable? We have used large and conservatively invested mutual funds as an example to illustrate how investment portfolios can be managed even if upside and downside market prices can deliver different results. 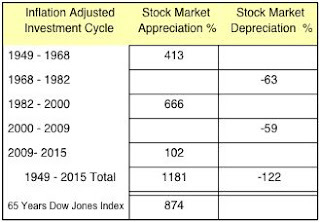 This example shows that the S&P index experienced a -53% drop from its peak to the bottom of the cycle. It then recovered +36% to its current levels in June of 2015. 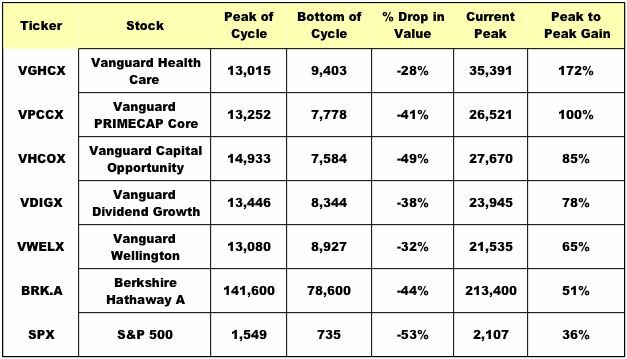 At the other end of our example Vanguard Health Care dropped only -28% from its peak to the bottom of the cycle. However, it recovered to its prices by gaining +172% in June of 2015. Other mutual funds, inclusive of Berkshire Hathaway A, show a range in the drop in value between -28% and -53% with peak-to-peak gains between +172% and +36%. We have examined 124 mutual funds in Morningstar designated as “GOLD” and rated better than “4”. [ii] In all cases we found that small drops in value from the peaks of the cycle were associated with higher levels of ultimate peak-to-peak gains. Our analysis of the consequences of tracking the tops and bottoms of cycles should also receive encouragement from our findings that more stable mutual funds will usually have higher 5-year and 10-year returns. Vanguard Health Care will show 5-year returns of 24.4% and 10-year returns of 13.8%. Respective returns for Vanguard Capital Opportunity will be 17.9% and 10.8%; Vanguard PRIMECAP 16.7% and 10.2%; Vanguard Dividend Growth 15.0% and 9.1%; S&P 500 Index 13.6% and 5.7% and Berkshire Hathaway A 12.1% and 9.9%. We conclude that despite the inevitable market cycles it is possible to minimize the effects of cyclical losses on the growth of mutual fund investments. A careful examination of the peaks and the bottoms of the prices of mutual funds over more than two market cycles can give us insights which funds to pick for protection against market fluctuations. Whether you call that timing is arguable. But we are satisfied that it may be possible to minimize risks for losses while maximizing the opportunities for gains whenever high quality mutual funds are examined for the patterns of prices shown during stock market several market cycles. Whether such patterns will repeat is unknown, though the down-and-up variations in the market prices of quality mutual funds should be considered as one of the characteristics that reflects the risks taken by the management of each mutual fund.